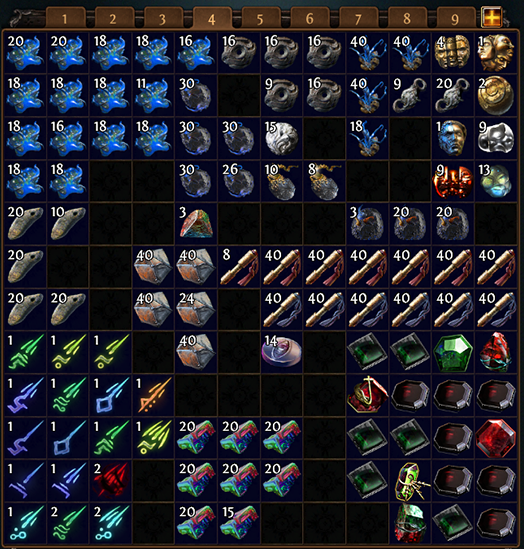 Path of Exile is a complex game with very unique currency system. Traditional currency like Gold Coins have no meaning here, instead there are various types of Orbs that can be used for improving equipment, as well as exchanged for other orbs or useful equipment. How the game system works is that it has many different recipes for specific items. Recipes are used at vendors to produce a wanted item in exchange for ones used in the recipe. However, there are so many recipes available, that even experienced players can forget about ones that are essential in the long run. This guide compiles the most commonly used recipes, as well as some not so common ones, that should be part of your recipe arsenal. 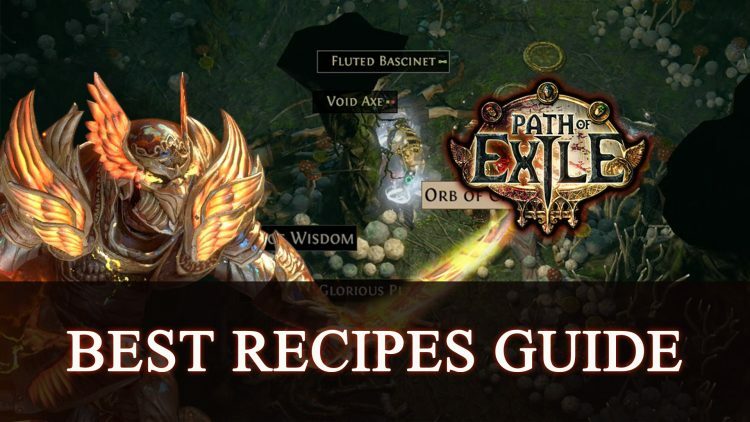 Due to the insane amount of recipes available to Path of Exile players, it is nice to have a more compact list like this one to have at hand, that can help new and experienced players in reducing the time invested in searching for the right recipe. We can arrange this list into Leveling and End-Game recipes. In this section we will take a look at commonly used recipes while Leveling. These recipes are going to be used a lot when starting newly introduced Leagues, since Storage is not shared across Leagues and there will be a higher demand for certain items. 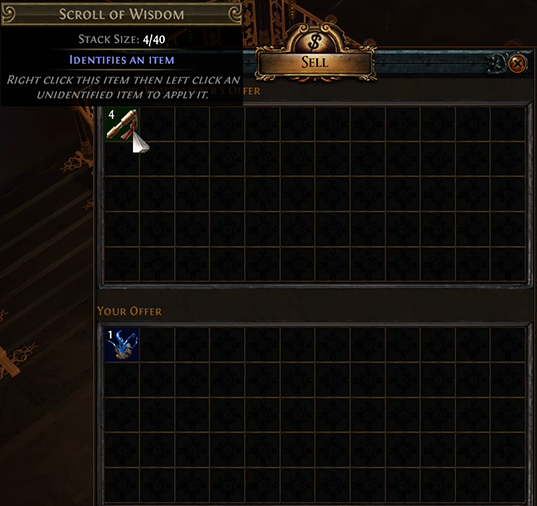 Scrolls are items that are easy to come by and are hoarded as your continue to play, but when beginning a new League, they are in short supply during first couple acts. 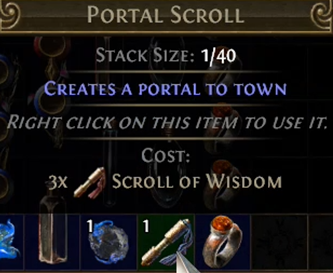 Portal Scrolls are especially useful in this case because the hold the ability to take you back and forth from town at all times. This especially helps in hoarding more valuable currencies must faster. This recipe can be directly purchased from the vendor Nessa in Act 1, meaning you need to choose Purchase option (instead of Sell) for this recipe to become available. 4x Scrolls of Wisdom can be obtained by trading one of these: Orb of Transmutation, Orb of Alteration or Blacksmith’s Whetstone. This recipe is great for players who like to speed run everything and can’t be bothered with picking up everything they see. All of those items can be hoarded in insane amounts quite easily, so spending some to get Scrolls of Wisdom is not a waste if speed runs are what you are after. This recipe can net you lots of Quality currencies and should be always on your mind. Everything in Path of Exile has a Quality property, it can go as high as 20%, as well as improve every item in some way. By adding many items of the same type, with a quality property that totals to 40% or over, you will gain Quality currency for that item type in exchange. Let’s take Weapons as an example, if we add trading Dagger with 7% Quality, Sword with 13%, Axe with 14% and Bow with 6%, we have a total of 40% Quality and for that we get 1x Blacksmith’s Whetstone. This works for all rarities. Note: Higher quality Skill Gems are worth more trading with other players, than exchanging for Quality currency. Weapon and Armor pieces sometimes come with Red, Green and Blue sockets that are linked together. 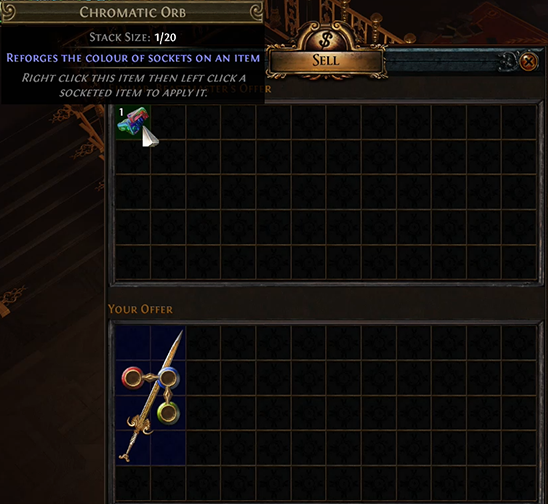 Such items can be exchanged directly for 1x Chromatic Orb. 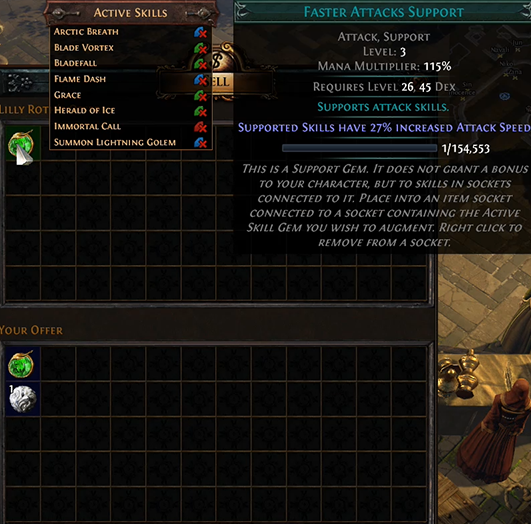 Chromatic Orbs are used to change the color of sockets on an item, making it extremely useful in end-game to get necessary socket colors on items that might not be ideal otherwise. This is a fantastic recipe to know throughout the game, as Physical or Spell Damage increase on Weapons is the best mod you can have. By using this recipe you will receive new blue (magic) weapon with such a mod in return. Weapons received are always Blue (Magic). Increased physical damage depends on Rustic Sash rarity and item level. Magic (Blue) gives 40-49% and Rare (Yellow) gives 50-69% increase. Increased spell damage depends on Chain Belt rarity and item level. Magic (Blue) gives 10-19% and Rare (Yellow) gives 20-29% increase. Gems have attribute requirements and sometimes when putting high level gems into different equipment, these requirements can be too high. In that case there are 2 recipes you could use to lower the requirements, by the lowering level of those gems. In this category we will focus on recipes primarily used after level 50 and for Maps. By this point, you should already have plenty low level currencies such as Scrolls of Wisdom, Portal Scrolls, Orbs of Alteration, Orbs of Transmutation, Quality currencies and Chromatic Orbs. Now it is time to focus on high level Orbs that are very valuable in trading and crafting. Two Handed Weapons and Armor Chest Pieces can have 6 Sockets if item level is 50+. By selling one of these items you get 7 Jeweler Orbs in return. These Orbs are valuable in crafting because a Jeweler Orb is used to re-roll a number of sockets on a weapon and armor pieces. 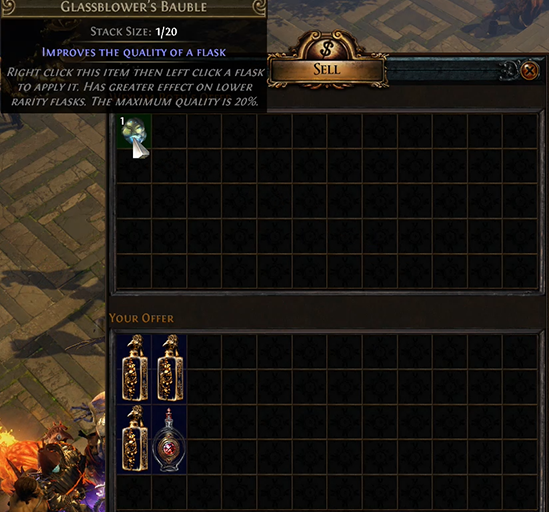 4 Jeweler Orbs can be also traded for Orb of Fusing (through Purchase option at some vendors). 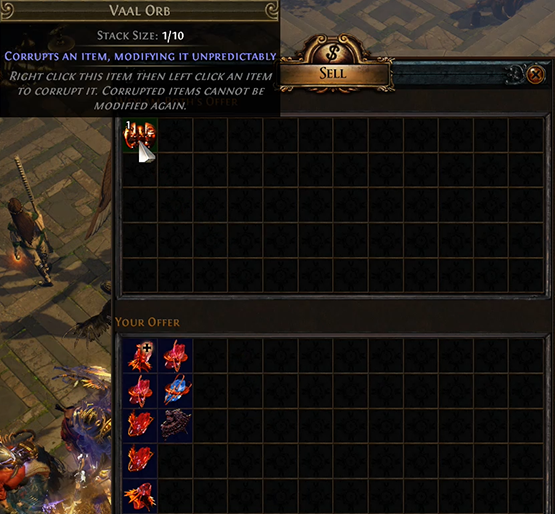 Vaal Orb is a high-risk high reward currency, that can be used on any item to make it much better or much worse. By trading Vaal Gems that do not have a trade value with other players, you can get yourself a nice amount of Vaal Orbs. Just make sure not to use Sacrifice of Midnight fragments in this recipe because it is too valuable. By trading in a full set of rare identified equipment (Two Handed Weapon or Weapon and Shield, 2 Rings, Amulet, Chest piece, Boots, Helmet, Gloves and Belt) that are all item level 60+, you will gain 1 Chaos Orb in return. 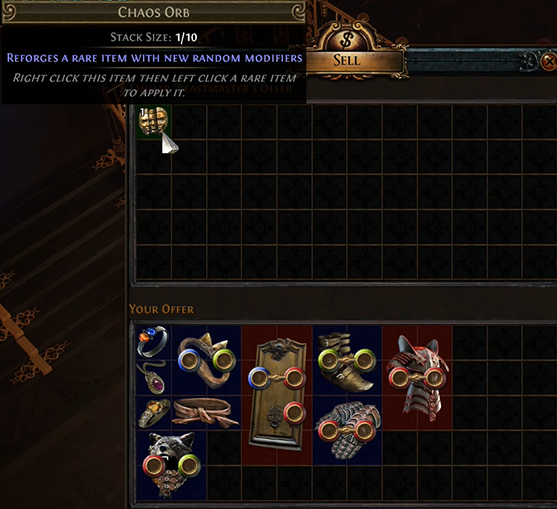 This is basically the same recipe but with unidentified items granted, 2 Chaos Orbs instead of 1. Both of these recipes are great ways to get a lot of Chaos Orbs. 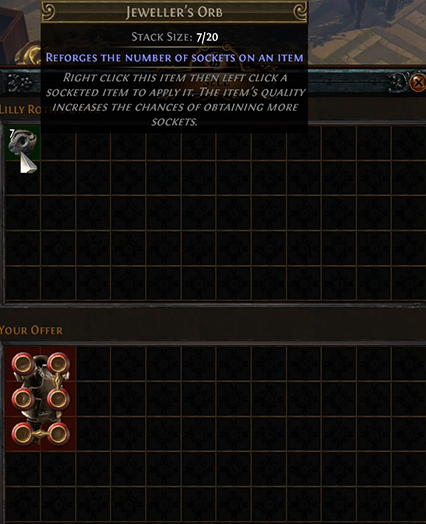 This recipe works the same as a Chaos Orb one, the only difference is we are selling full sets of rares with ilvl 75+. Identified set yields 1 Regal Orb and Unidentified set yields 2 Regal Orbs. This is the most common recipe for Cartographer’s Chisel. Chisel is vital as an end-game item, as it improves quality of Maps. Rock Breaker, Stone Hammer and Gavel can be of any rarity. It is best to use normal (white) ones and upgrade them to 20% with 4 Blacksmith’s Whetstones. 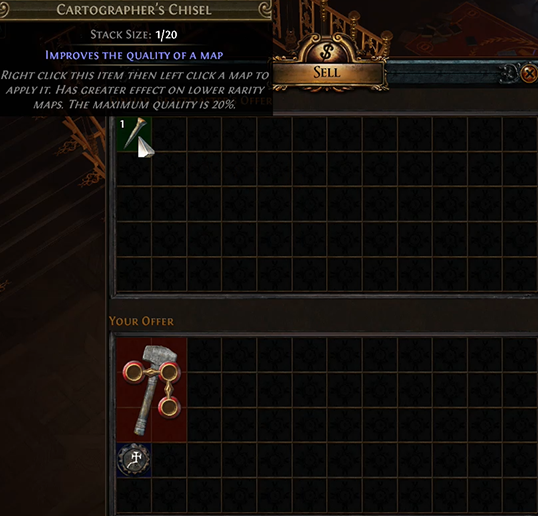 By trading in 3 same named and tiered maps, you can gain the same named map but a higher tier version. 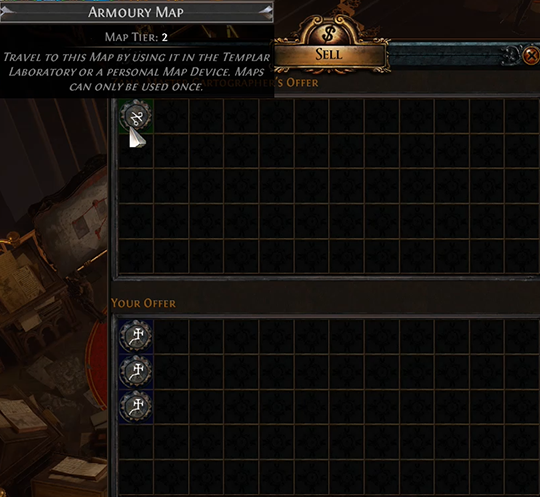 For example, trading 3x Dungeon Tier 1 maps will yield 1x Dungeon Tier 2 map. Rarity depends on the lowest rarity among the initial maps. Exalted Orb is one of rarest and most valuable currencies in the game. Acquiring them requires trading full sets of either identified or unidentified rare Shaper or Elder items, which happens a lot later in Path of Exile. You must also be wary that you will only receive 2 Exalted Shards for identified or 4 Exalted Shards for unidentified. 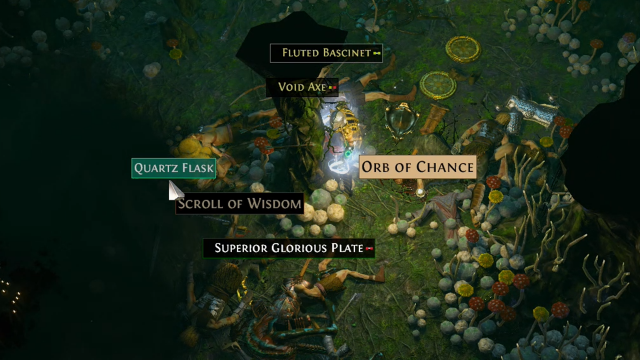 20 Exalted Shards make 1 Exalted Orb. Another way is to trade Mirror of Kalandra but that is not worth it in my opinion. This recipe is suitable for players who want Exalted Orbs and have amassed lots of different currencies already. Chromatic Orbs are easy to obtain through the RGB Linked recipe, so this is a great way to clear storage space and get something great in return. Recipes featured in this article are the ones most commonly used and worthwhile to gain. There are quite a large variety that’ll you come across in Path of Exile, but most of them require a great deal of time to be invested and do not have a worthwhile pay off in the end. Most experienced players already know these but it is easy to forget some of them, especially if not used frequently. The more you progress through the end-game, the less recipes you will generally use because most currencies will amass by simply playing Maps. Until then, this article can aid you in preparing for end-game content by not missing out on those important items! If you enjoyed this guide be sure to check out more of our Path of Exile guides in Path Of Exile: Beginners Guide 2019. and Path of Exile: Beginner’s Guide to Atlas of Worlds and Maps 2019. Or you can read about the latest news in Path Of Exile Release Gets Delayed Until February 2019. Stay tuned for more of our Guides, be sure to read our Prophecies Guide and Hideout Guide next. 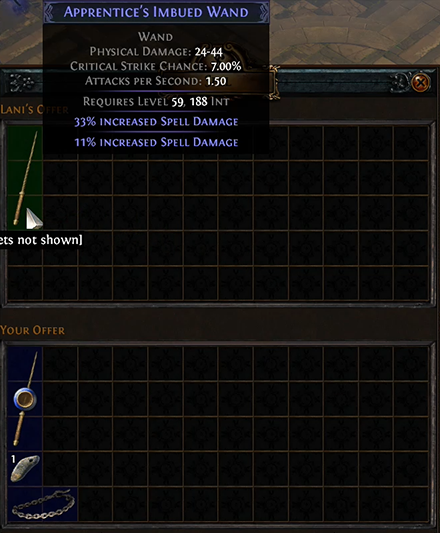 Unless this is a console exclusive recipe the 200 chromatic for an exalted orb is not a thing.